And now onto the post! We have made some recent investments into our Data Loss Prevention (DLP) capabilities. More specifically, we are adding support for HTTP and Custom Connectors to DLP policies Which can be created or modified using PowerShell or the given Flow Templates. Data Loss Prevention (DLP) policies provide an ability to restrict what connectors can be used within the same PowerApp or Microsoft Flow. These policies can be established by either Environment or Tenant Administrators. Each DLP policy includes two data groups: Business and Non-business data. 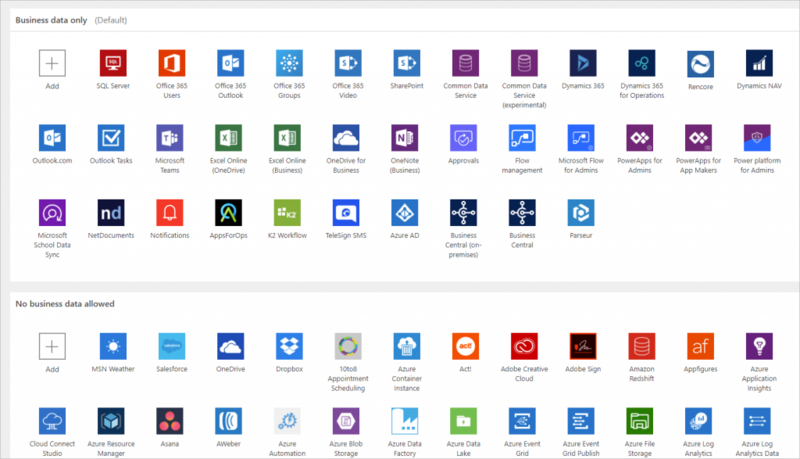 An administrator can choose a default data group to automatically include any new connectors that become available to PowerApps and Microsoft Flow. We have also added the ability to include and manage custom connectors in DLP policies. These connectors must also be added to a policy via the PowerShell or Flow Template and will then be manageable in the Admin Portal. Note: Only Custom Connectors stored in a tenant’s default environment will be displayed with its given icon and display name in the policy editor. All other custom connectors will be displayed with the default connector icon and their internal name. A paid Microsoft Flow/PowerApps Plan 2 license or a Microsoft Flow/PowerApps Plan 2 trial license. You can sign-up for a 30-day trial license at https://web.powerapps.com/trial. Trial licenses can be renewed if they’ve expired. We are currently implementing HTTP and Custom Connector support for DLP policies as Flow Templates and PowerShell scripts with plans for UI support in the future. This provides administrators with an opt-in choice as to whether they would like to implement this new capability. To add a custom connector, please use this template. To add HTTP support to a DLP policy, please use this template. Backing up existing policies using the PowerShell cmdlets or the Power platform management connector. Running the following PowerShell cmdlets in a non-production tenant. A corrupt policy may impact other DLP policies from being displayed within the PowerApps/Flow admin portal. To add a custom connector to a policy via the new template, simply enter the policy name, the group to add the connector to, and the connector’s name, id, and type. Run the Flow once and the custom connector will be added to the policy and group specified. To add the HTTP connectors to an existing policy via the new template, enter the name of the policy you’d like to add them to and run the Flow. To add support for custom connectors and/or HTTP connectors to a policy using the PowerShell, download and import the latest PowerApps PowerShell scripts from the link above and use the cmdlets ‘New-AdminDlpPolicy’, ‘Set-AdminDlpPolicy’, ‘Add-CustomConnectorToPolicy’, and ‘Remove-CustomConnectorFromPolicy’ to modify a policy. The cmdlet ‘Get-Help <cmdlet name> -detailed’ can be used as a reference. Note: Use the schema version ‘2018-11-01′ when creating or updating a DLP policy to include HTTP connectors. Adding HTTP support using the template or PowerShell will only affect the specified policy. New policies created via the Admin Center will not contain the HTTP connectors. Caution: WE DO NOT SUPPORT DOWNGRADING FROM SCHEMA VERSION 2018-11-01. Once HTTP support is added to a policy, it cannot be taken away. Attempting to do so may corrupt that DLP policy. Furthermore, if a DLP policy is updated to support HTTP connectors, current flows using these HTTP capabilities may be shut off.